As summer comes to an end, so does the availability of British grown seasonal foods such as berries and crisp salads. But foodies shouldn't fear - while Autumn may bring with it long nights and cold weather, it's also the perfect time of year for some of the very best fresh produce the UK has to offer, many of which contain disease fighting nutrients. Autumn is a great time of year for English apples, and not only do these taste amazing but they are full of flavonoids, potent antioxidants that are known to lower the risk of heart disease, heart attacks and some cancers. They are completely versatile, and can be used in both sweet and savory dishes, including apple pies and crumbles and sauces to accompany Sunday roasts. Apple's aren't the only fruits Autumn gives us - pears are almost as versatile as apples, and are high in fibre, lowering blood cholesterol levels and improving blood sugar control. They can be used on salads or in sandwiches or can be poached for a warm, sweet dessert. Often ignored until Christmas day, parsnips have a sweet, delicate flavour and are a great source if of fibre, vitamin C, calcium and iron. The best flavour comes from smooth and firm, small to medium sized parsnips, and these can be boiled and mashed together with carrots or steamed, boiled or roasted a side vegetable. They also make a great addition to soups. Autumn is the perfect time of year for pumpkins and squashes, but too often pumpkins are thought of as a Halloween decoration rather than a food full of beta-carotene, an important antioxidant, as well as vitamin C. Even the seeds of pumpkins are packed with nutritional value, and can be roasted from a fresh pumpkin in a hot oven. 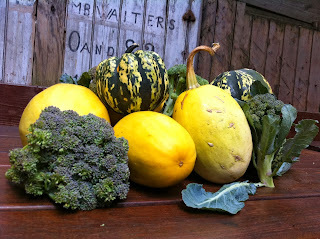 Winter squashes are one of the few vegetables that do not loose quality after picking and can be stored for months on end. In fact, during storage, the vitamin A content increases, making them a great source of heart-healthy nutrients. Turnips, or swede depending where in the country you live, have a tough outer skin with a white flesh that's bitterer in flavour than potatoes. They are a member of the mustard family and are a great source of fibre and cancer fighting toxins. They can be cooked in a number of ways, including boiling, roasting or mashing. Finally there's the sweet potato. Not normally associated with British gardens, the sweet potato is easy to grown in sheltered spaces and contains one and a half times the amount of vitamin C found in an ordinary potato. However the name is slightly misleading - sweet potatoes are not related to the traditional potato, and is in fact a root vegetable rather than a tuber. Firm, smooth skins are a sign of a good quality sweet potato, and as well as vitamin C, they contain four times the recommended amount of vitamin A and are an ideal choice diabetics since they are full of slow release carbohydrates, helping to steady blood sugar levels. Switch On Better gives you the latest tips for weight loss. If you want to know how to loss weight and weight loss diet plan we would help you. Tip for weight loss would help you how to lose weight and our weight loss diet plan works. Truweight is India's first of its kind of company offering weight loss program on losing weight through superfoods instead of pills, surgery, gadgets or false promises. We provide a dedicated nutrionist mentor, 100% natural superfood kit and a proper food plan to help you lose weight. How to Lose Weight Fast here's expert advice for losing weight and burning fat fast! Simple step weight loss plan is proven to bring fast results, and keep it off is to create a low-calorie eating plan that you can stick to for a long time.